The best beaches in Vietnam are found south of the DMZ – from Hue south to Phan Thiet is a stretch of great beaches. Many are rarely visited and hard to reach. The most popular resorts are described below but a willingness to get off the (lightly) beaten path will yield remarkable coves and patches of sand. This picture is taken from a train south of Hue. Lang Co beach is an amazing stretch of sand. If you’re looking for quiet and solitude this could be your place. Near to Hai Van Pass and Elephant Springs the Lang Co Beach Resort is great value. China Beach south of Danang and adjacent to Marble Mountain is my favorite beach in Vietnam. For very cheap and friendly accommodations check out Hoa’s Place. Looking north from China Beach towards Danang and its fast developing coastline. Looking south from China Beach. The beach extends uninterrupted until Hoi An’s Cua Dai beach. The pool and beach at the Golden San Resort at Cua Dai beach near Hoi An. The great beach in front of one of Vietnam’s most loved hotels, Victoria Hoi An Beach Resort & Spa. The beaches of Nha Trang. Nha Trang’s beaches can be quite busy and the sand is not my favorite in Vietnam but all-in-all not a bad place to hang out for a few days. Nha Trang’s Louisiane Brewhouse has great beer, good food, a fantastic pool, and a good stretch of beach. A quieter option to the buzz of Nha Trang. Mui Ne is low key. The beaches in Mui Ne are narrower than at Nha Trang and Danang, and in some places develop large dune-like drops. Fun if you’re a kid and love to jump into the sand. The beaches of Phan Thiet are popular with Vietnamese and the hotels cheaper than Mui Ne. Phan Thiet is south of Mui Ne and has a similar low-key feel. A boat on the island of Phu Quoc in the far south of Vietnam. A popular beach restaurant on Phu Quoc. 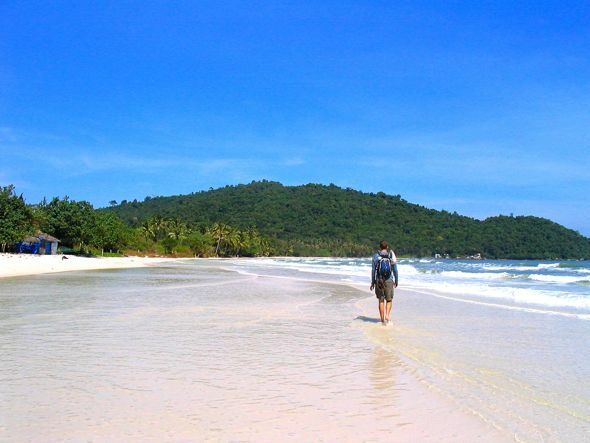 The beaches in Phu Quoc are some of Vietnam’s best. I love how calm the water is in Phan Thiet. The beach is very clean and beautiful, it’s really a perfect getaway to bring your kids! Yes, great area. Love it.